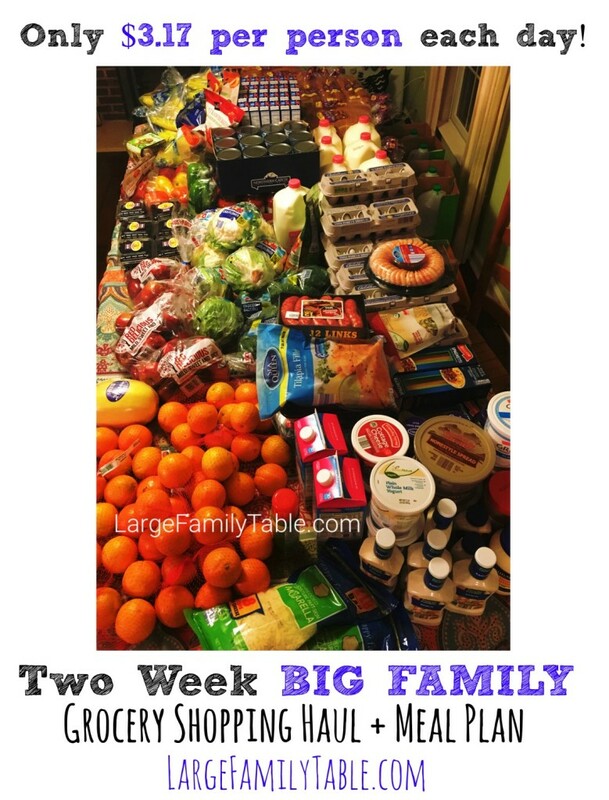 My son Zion and I hit the stores one morning for a two-week grocery shopping haul for our big and bustling family. 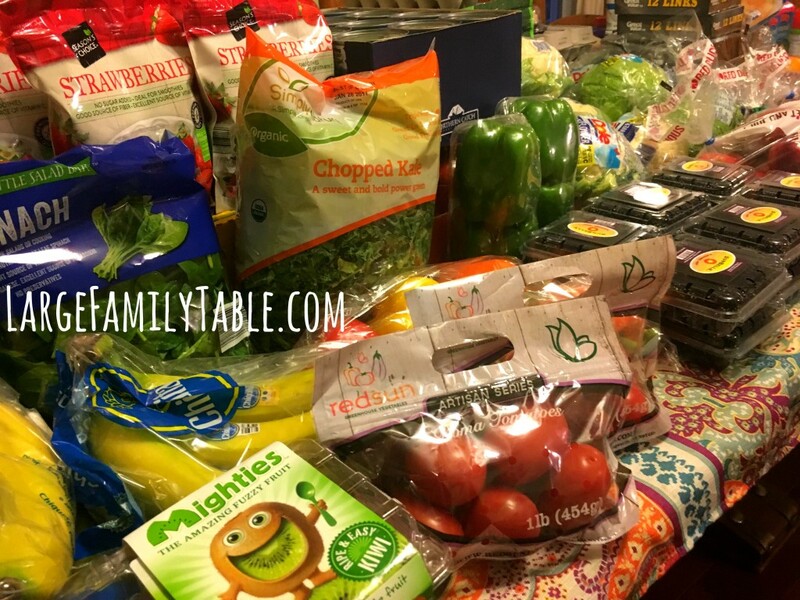 You can watch our actual shopping time here in Mom’s Day Out Large Family Shopping at Aldi, Dollar Store, and Walmart. At Aldi, I spent $366, plus in a separate transaction, I received a $10.22 refund for chicken I was double-charged for in my last large family grocery haul. I got 98% of everything we needed at Aldi, which is becoming more and more of my norm. I wasn’t finding the meat I wanted at Aldi this week, and I needed a few items for an upcoming birthday at Walmart. So I spent another $34 at Walmart on ice cream and candy for the kids (a junkie treat 🙂 ) and two meat packages. Walmart still didn’t have what I was looking for either. It was just an off shopping trip meat wise, I guess. 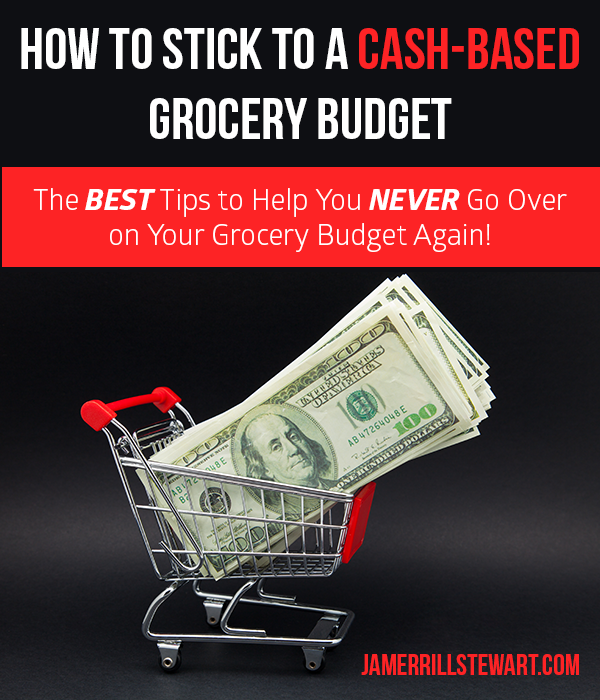 You also might find How to Stick to a Cash-Based Grocery Budget helpful. 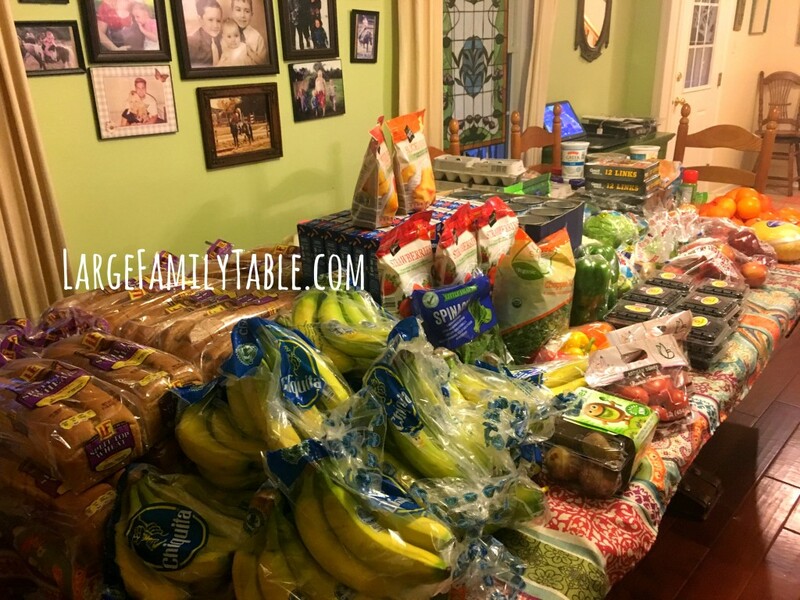 This two-week grocery shopping haul comes in at around $391 ($366 at Aldi – refund of $10.22 + $35 at Walmart) for our family of nine. Including my big and tall husband, two teen boys, my pregnant self, and five busy and bouncing kiddos ages 10, 7, 6, 4, and two who EAT! We’re also home full-time homeschooling and running a home business (my blogging/YouTube and online efforts you can read more here in How I Support My Family of Nine Online). This means we don’t have any away from home school breakfast or lunches to factor in our meal plan. My husband is finishing up his last semester of college, but I pack his lunch most days (hello leftovers!). This breaks down to $3.17 per day for each family member. Considering there are some days even the two-year-old will eat four eggs for breakfast I think it’s pretty good overall. Oatmeal which you don’t see in this haul, but we have several in the pantry. 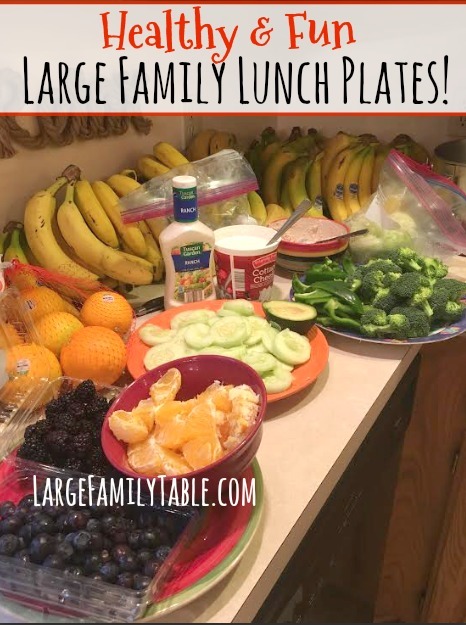 Fruit/Veggie Plates We love to set out all the available fruits and veggies and make individual lunch plates full of everyone’s favorites. To do this though we need to have a lunch time at home without having to run out for errands. We have several days during this two weeks that we’ll have to run out around lunch time. On those running days it’ll just be sandwiches and fruit on the go. All dinners will be served with lots of fresh veggies. I also shove spinach and kale into whatever dishes I possibly can. Tilapia/Veggies I haven’t filmed this as of yet. Here are several Tilapia in foil packet recipes Baked tilapia and veggie foil packets, Tilapia Foil Packets, and Foil Packet Baked Lemon Tilapia. Big Weekend Meal: Beans/Cornbread Here’s Jamerrill’s Beans, Rice, and Cornbread Recipe | Large Family Style! Big Weekend Meal: Ham/Northern Beans Soup Try Basic Ham and Bean Soup, Great Northern Ham & Bean Soup, and White Bean and Ham Soup. Leftover Night(s) Some meals will carry leftovers and some will not. We’ll use them when we have them. Pantry Challange Night(s) We have some traveling coming up, and I plan to do some pantry challenges before/after our trip. I like to have banana bread fresh or in the freezer too, but don’t know that I’ll get to it this go round. You can read more large family snack ideas here. 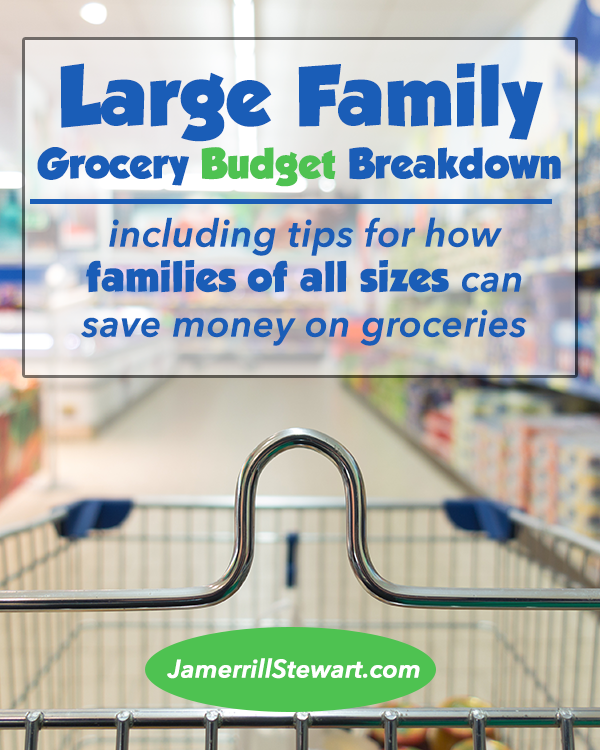 Click here to see all my large family grocery hauls. 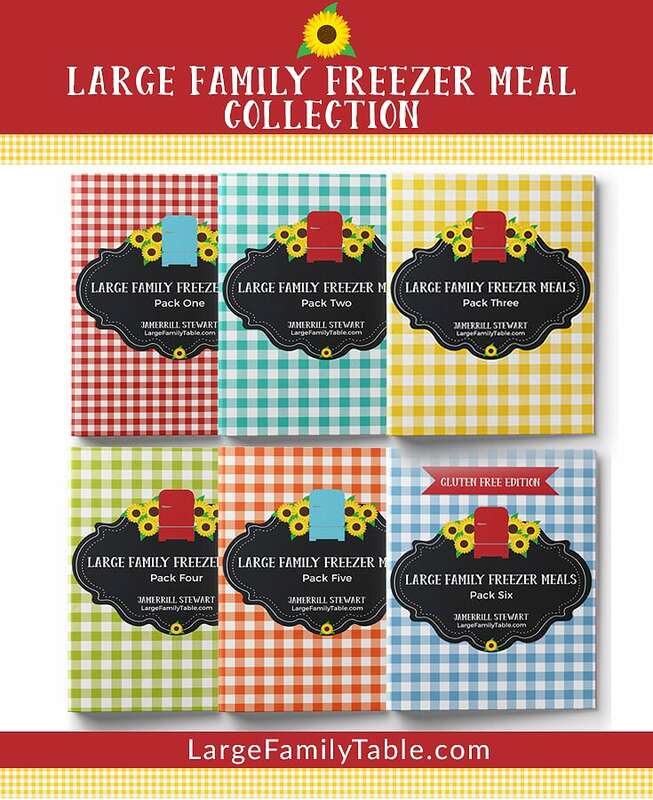 And here are all of my large family meal plans. Peel the kiwi fruit, slice them up and enjoy in a fruit salad or on cereal for breakfast or just eat like an apple. But don’t eat the skin! Also here in Australia we can also get the gold kiwi fruit, same as those except golden yellow inside 🙂 For your homeschool facts, they grow on a vine like a passionfruit. You can also dice them up, blend with some pineapple or banana and a smidge of soda water or water and add to a smoothie or freeze that mix in an ice block tray for adding to cold water or making ice blocks for the kids. Kiwis are fine on THM in E meals…and I think a half is even ok in an S meal if I’m not mistaken. Either way you are so cute and I just love your videos! Really, great to know! I haven’t bought them in a long time and never checked. Another viewing friend told me that carb count was for TWO kiwis, which is much better! I have been watching you for the longest time. I seriously wish we has an Aldi’s here. Your milk and egg prices there are unbeatable. Thank you for sharing. I found your videos just yeaserday, but I was wondering, how much of what you buy goes bad and doesn’t get eaten? I know my bananas are usually brown after about 6 days, and you have so much produce that you depend on lasting a while. I have been watching your videos. You have helped me to budget my time and money. Good bless that beautiful family of yours. I wish my aldi store had such a good prices. Thank you for taking the time to share. ? With regard to the bananas. Separate them when you get home and stack them up into the baskets. That way they’re easier for the kids to just grab one banana without tearing the top of several and they will ripen individually instead of as a bunch. Also, why not just freeze a bunch when you get home? That way you have them frozen! Leave your tomatoes out on the counter in a bowl, they will be so much more tastier than hard and cold from the fridge. Also onions, potatoes, sweet potatoes, root veges can all be stored in baskets on the pantry floor. Air will circulate around them and they’ll keep fine cause it’s dark under the stairs. 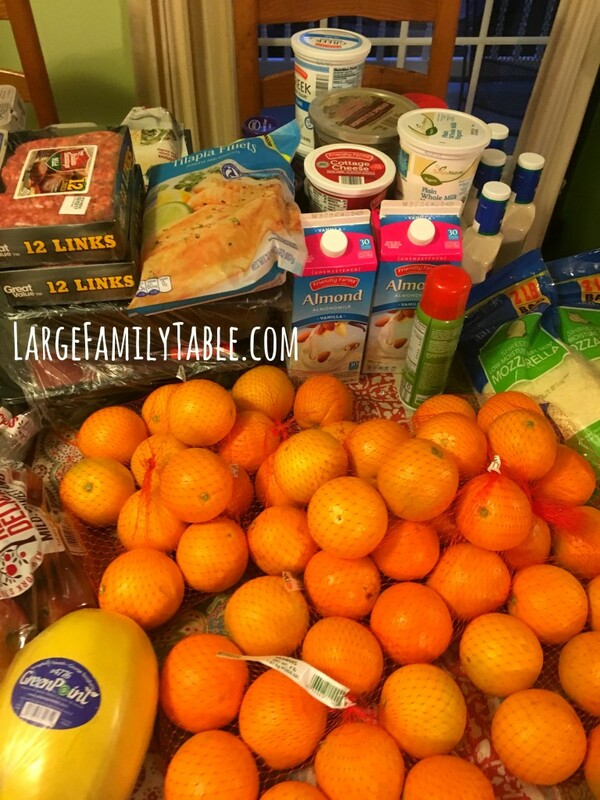 Apples and oranges too will be ok in bowls or baskets on the counter top. That way you’re taking their plastic wrappers off and they have a chance to breathe and the kids can see what you have readily so they can then help themselves. Wow! Our Aldi’s is almost double in everything except mozzarella cheese and one other thing. 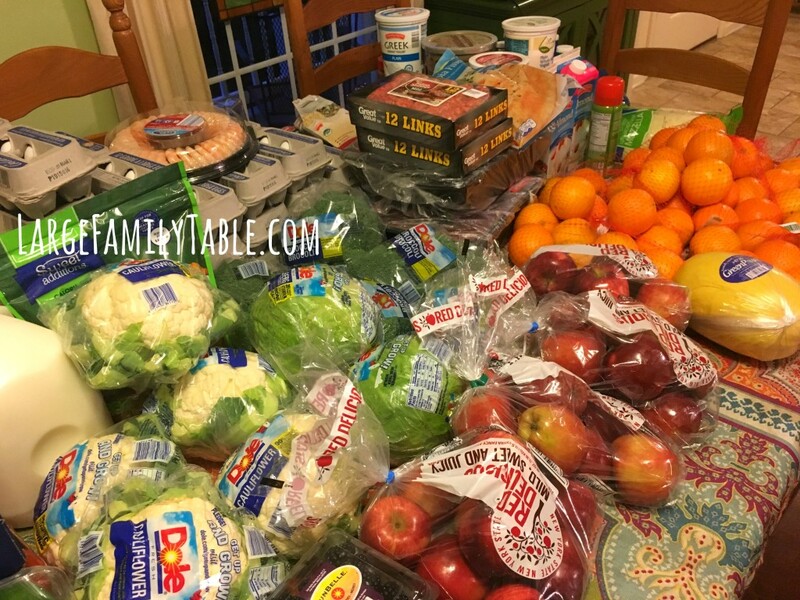 Our 17 year old daughter does all the shopping and tries to keep our budget around $200 a week and sets aside $30 to for Costco. (We budget $230 and whatever is left goes to an account and when there is enough we make a trip to Costco) Not included is any of my THM extras. We are a family of soon (past due) of 12 :)!!! 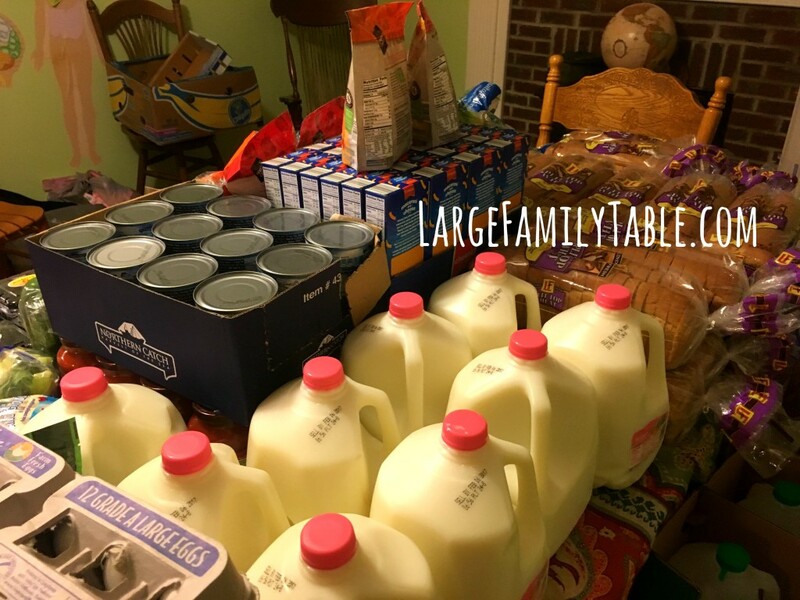 Our oldest moved into his own home a few month ago, but being pregnant didn’t change the budget. LOL!!! !